Yesterday, I treated myself to a pedicure at Soho Sanctuary. Imagine my surprise and delight when I discovered they had the entire line of Deborah Lippmann nail polishes at the ready! 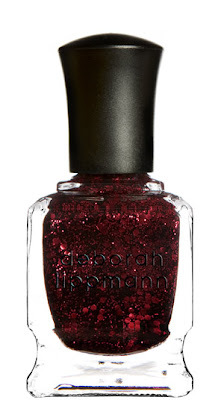 I simply had to go with Deborah Lippmann Ruby Red Slippers, a blackened ruby with oversized chunks of crimson glitter. I've honestly never seen a polish like this! My nail technician, Natasha, painstakingly and meticulously applied two coats to absolute perfection. And while I'm normally not a fan of showing off my toes, in this case, you simply have to see how amazing the polish looks on the nail. Can you believe the uniqueness of this polish? I'm in love! Deborah Lippmann Ruby Red Slippers retails for $20 at beauty.com.